Theo Wanne Enters Instrument Market with History-Changing MANTRA Tenor Saxophone. Theo Wanne™ Theo has followed his passion for creating the best musical products in history and produced the most advanced saxophone ever made. Just like with his mouthpieces, Theo has married the beauty and best of the old with the precision of the new, resulting in a technologically and audibly superior saxophone. 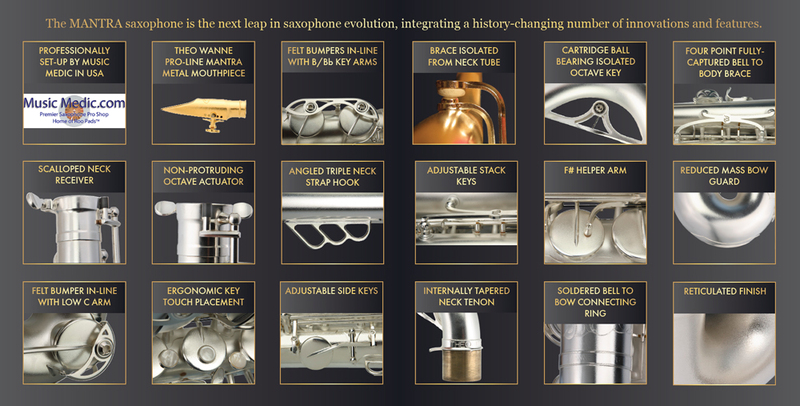 The MANTRA saxophone is the next leap in saxophone evolution, integrating a history-changing number of innovations and features, including a neck that has total vibrational freedom. Nothing is soldered to the neck tube- a revolutionary leap. 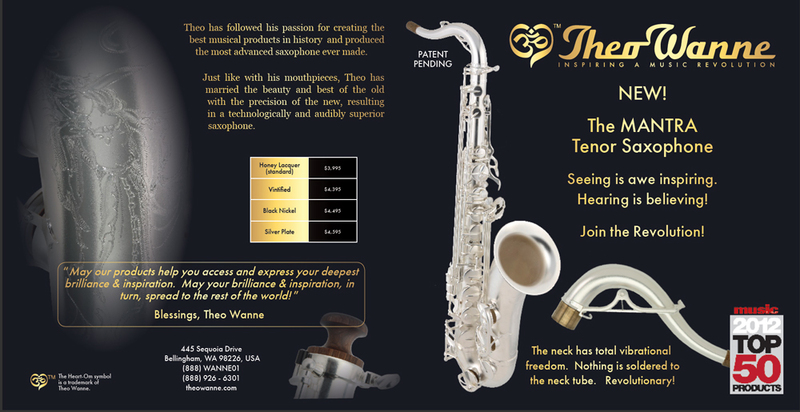 The new and revolutionary Theo Wanne saxophone is called, The MANTRA. A mantra is a sound, or group of sounds, that leads the speaker to freedom! The feeling of freedom and full self-expression is what the MANTRA saxophone and its history-changing innovations are designed to produce. Critical designs, parts and assembly are done at the Theo Wanne factory in Bellingham, WA USA, and at MusicMedic.com in NC, USA. Theo has created a uniquely designed mouthpiece for the MANTRA tenor in-line with its full bodied, huge projecting sound! The saxophone neck is the most crucial part of a horn’s sound and soul. Theo has applied new concepts to his patent-pending design that have proven to be a quantum leap forward in neck design. His completely redesigned neck tube has nothing soldered to it except at the octave pip, which must be there. It has no keys, guides, or braces soldered to the tube to dampen it. The octave key rides on cartridge ball bearings, and is completely isolated from the neck tube and brace. This is one of over 30 innovations and features. Just like with saxophone mouthpieces, Theo Wanne has owned and studied every type of vintage and new saxophone. He has combined the huge and beautiful sound of the vintage horns (such as his favorite Conn Chu and Selmer Mark VI saxophones) with the intonation and playability of modern horns. Theo has then applied innovative thinking and advanced technology to create a historically superior saxophone. Theo Wanne is the eminent world expert on woodwind mouthpieces. The company is respected for its revolutionary products that inspire musicians and is considered the world’s premier woodwind mouthpiece manufacturer. Theo WanneTM is attracting the world’s top musicians, dealers, distributors, and OEM prospects. You can learn more about Theo WanneTM by watching their new company video, Theo Wanne – Manufacturing and Innovations, or visiting their new website: theowanne.com.